Our beloved cat, Feemy, was two years old and the mother of Squeaky, who was one year old. 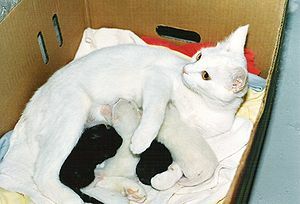 Squeaky gave birth to four lovely kittens. We had fixed her a box a few days before the event, and she seemed content with our nest for her little ones. In the meantime, we had to prepare another box for Feemy, who was also expecting. A few days after Squeaky’s arrivals, we discovered Feemy had performed her task. We looked for her kittens but couldn’t find them. Shortly thereafter, we noticed Feemy going into Squeaky’s box, so we took a look inside. Sure enough, Feemy’s three beautiful newborn kittens were there, along with Squeaky’s four older ones. Wanting to make things more comfortable for them, we transferred Squeaky’s four kittens into a larger box. But, the next time I went out to inspect the litters, Squeaky had carried one of Feemy’s kittens into her box. So, I picked it up and put it back into the “right” box (where Feemy’s other babies were). This process was repeated over and over, until finally, all the kittens, somehow, ended up in one box, all mixed up. That’s when we decided to let the cats handle the situation their own way! The arrangement now is that all the kittens – babies and grand-babies — are together in one box, along with mother and daughter, who take turns “kitten sittin’.” I guess you could call it an “extended family”! This entry was posted in Angie's Smorgasbord and tagged babies, cat, daughter, expecting, family, grand-babies, kitten, litter, mother, newborn, Pets, short story.